The Reverend Richard Evans has been a member of the Clergy Team at Saint Andrew's, St Andrews since May 1995. Whilst a member of the congregation of St John’s, Forfar, he began training under Bishop Michael Hare Duke for the newly instituted Non-Stipendiary Ministry, was ordained Deacon in July, 1976 and priested on St Margaret’s Day In St Margaret’s Church, Leven in the same year. He served as an NSM in St Margaret’s until May 1995 when he was appointed Director of Music at Saint Andrew's. His wife, Roselind, is a professional pianist, and their three children David, Bronwen and Katharine are also musicians. Richard and Roselind have four grandchildren, and one great-grandson of whom they are very proud! 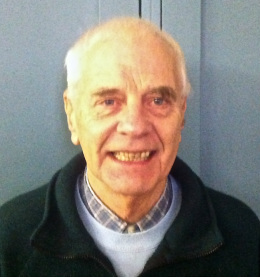 The Venerable Gordon Ogilvie has been a member of the Clergy Team at Saint Andrew's, St Andrews since 2007, when he retired after 40 years of ministry in the Church of England, for which he trained in London after earlier education in his native Glasgow. Husband of Sylvia, Dad to Anna and Alastair, and Grandad of Benjamin and Ellie, Gordon has held five full-time posts in ministry.Three were in parishes: in stockbroker Surrey, urban North London and New Town Essex. Two were specialist roles: training ministry candidates in Pastoral Studies in Oxford; and providing pastoral care and oversight to ordained and lay church leaders as Archdeacon of Nottingham. Other interests have included music and liturgy, making ministerial appointments and longstanding links with the Church in Uganda. .The Reverend Jim Thomson celebrated his 25th year as an Episcopal priest in 2014 and, before retiring, worked for many years in the USA. Since returning to Scotland, he has been in charge of congregations in Fife and Aberdeenshire. Although he is often to be found helping elsewhere on a Sunday, He regards Saint Andrew's as his home church, and is delighted to be numbered among the Rector's assisting clergy.